Today I had the pleasure of speaking to a group of museum professionals at the 2010 annual conference of the Michigan Museums Association. The audience was made up mostly of Gen X and Boomers who readily acknowledged that attracting Millennials has been a challenge. Even museums located right on college campuses say it is not always easy to engage Millennials in what they are offering. The main culprit seems to be the high level of competition for leisure time. But the audience also expressed concern that the content and mission of many museums may not be in sync with Millennials’ interest and values. One gentleman explained that his folk music museum had made a huge effort to attract Millennials to a free concert. The event was well-promoted, and even offered a beer tent, but attendance was sparse. Those who did attend thought it was ‘awesome’. Others shared similar stories of frustration. In preparing for the conference, we conducted a survey among our Gen Y “Super Consumer” market research community to find out where museums stand in the priority scale for the leisure time and dollars. The good news is that Millennials say they enjoy museums and think they are a ‘good value’. Millennials are as likely to rate museums as ‘one of my favorite things to do’ similarly to how they rate movies, theatre, a city park or even ‘spectator sporting events’. Over two-thirds say that museums are either a ‘superior value’ or a ‘very good value’ for the time and money relative to other leisure activities. The bad news is that they devote a small portion of their leisure spending to museums, far less than they spend on other activities like eating out, movies, theatre or fitness. Two-thirds visit a museum once a quarter or less often. Twelve percent say they don’t go at all. This disconnect between attitude and behavior represents an opportunity for museum marketers. When asked what would get them into museums more frequently, most say ‘special events’ or ‘coupons’. A smaller number suggest more digital app’s or interactive features. Interestingly, opportunities to get more involved via volunteerism are not appealing. Just 5% said this would get them to visit a museum more often. This finding was consistent with the experience of the museum marketers who have not seen a lot of Millennials lining up as docents or volunteers. Based on these findings as well as some discussion among our community members on their most ‘memorable museum experiences’, we offered three suggestions to the audience for moving more Millennials into museums (how’s that for alliteration?). 1. Make the Experience Personal and Interactive. 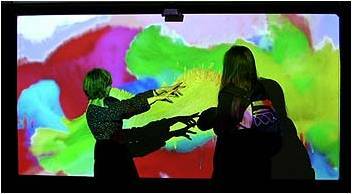 These museums have highly interactive spaces where visitors can throw digital paint, use blowers to affect paintings and even affect the display for future museum visitors. Both MOMA and the Art Institute of Chicago have introduced iPhone app’s designed to compliment the museum experience and bring it alive. An interesting side note is that the MOMA app was designed by Millennials. Community members Sarah Ewing and Katie Lorenz each mentioned the after hours program at the Art Institute of Chicago as a memorable museum experience. 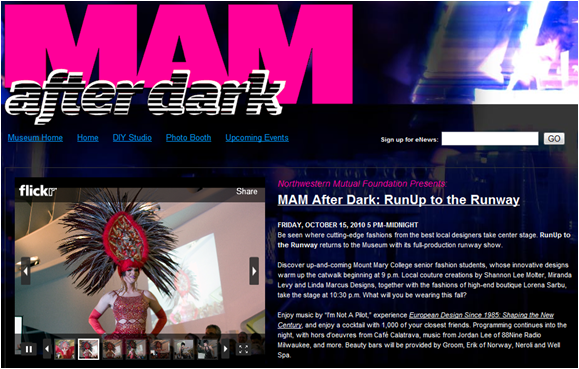 Others mentioned the Milwaukee Arts Museum’s summer long Art After Dark program. Millennials want to be able to share and connect. Visiting a museum is a social event – who goes alone? And it’s only natural to want to connect with others who share your interests. 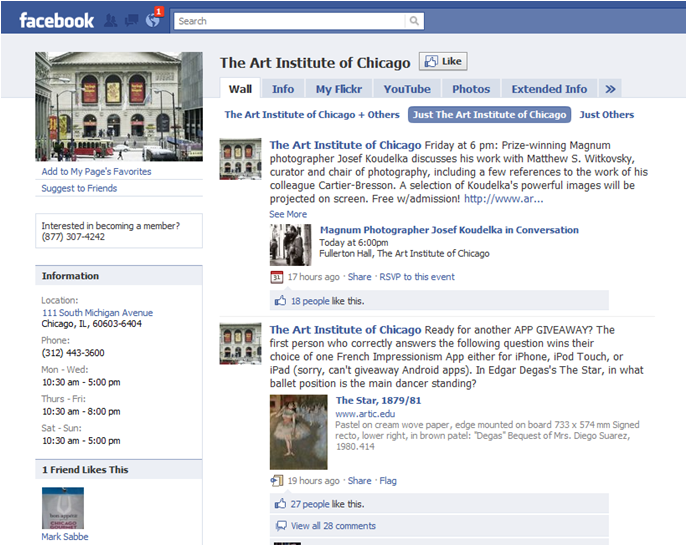 The Art Institute has over 52,000 ‘likes’. 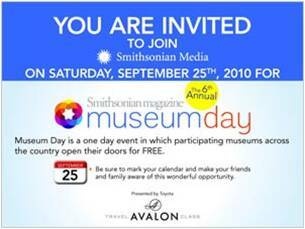 On September 25, the Smithsonian along with 1300 other museums across the country offered free admission as part of their 6th annual ‘Museum Day’. (see picture above) Events like “Museum Day” seem to hit the ‘trifecta’ of Millennial marketing – a fun experience, a social incentive (free admission) and a cause. According to a MediaPost article, the event was a success (although it didn’t say how many of the attendees were Millennials). Over 300,000 people took advantage of free admission and two million people went to Smithsonian.com to get info. Corporate sponsors included Microsoft and Toyota. Microsoft gave away tip cards at the museums on how to ‘Make Your Museum Visit Great.” The cards also encourage ticket holders to use Microsoft Office products and direct visitors to the “Make Education Great” hub to enter to win $25,000 to help schools in their areas. Toyota donated $1 — up to $10,000 — to museum programming nationwide for each online consumer query about its Avalon full-sized sedan.